I love Christmas. I actually love the winter. Not so much because of the snowy cold weather but because some of the best memories I have in life came during those winter months. As much as I love the Christmas season I also know it’s a time when many people go into debt, which I hate. There’s no reason to blow your budget in the name of Christmas and you should avoid debt at ALL costs. 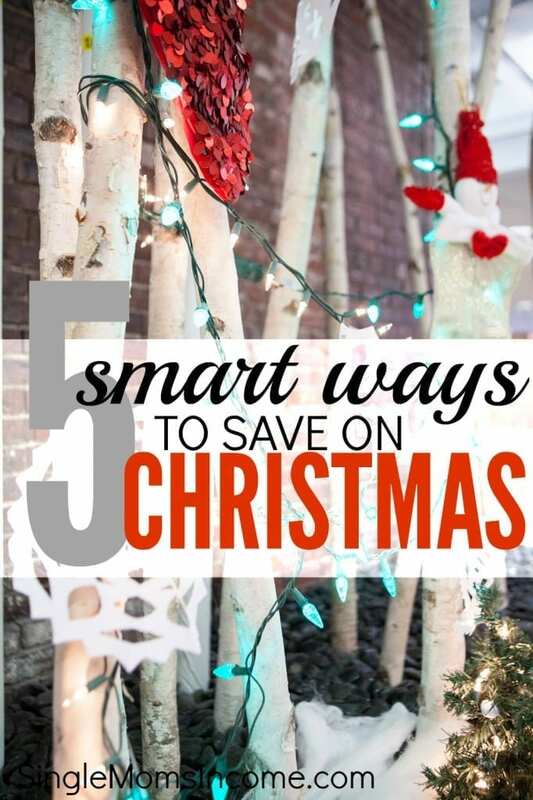 Here’s five smart ways to save on Christmas and keep yourself from touching those credit cards! The very first things you need to do is calculate how much money you can realistically spend without breaking your budget or whipping out the credit cards. When you set this number and know what you have to work with, you can then go on to break that number down even farther for individual gifts. Now you need to create a list with the name of each person you have to buy for, how much you can spend on them, and several gift ideas. When you have several different gift ideas for each person you can start watching for those amazing deals that fit in your budget. This will help you find the perfect, budget friendly gift for each person on your list. If you’re worried about the dreaded Christmas guilt, when someone spends far more money on you and your family than you do on theirs, you need set clear expectations now. Have a talk with your family and set a budget for each other. Or, just agree that adults won’t buy for other adults. A couple years ago my family switched to a Christmas exchange, with each family member drawing a name out of a hat. We set the budget at $25. Knowing that we only have to spend $25 and only on one person has been a huge relief for everyone in the family. That stress relief has actually allowed our Christmas dinner to be more enjoyable! While I do try and support local businesses as much as possible when it comes to shopping from large retailers I truly believe shopping online is the way to go. With deal sites it’s so easy to find out where the bargains are and by shopping online you’re resisting impulse purchases. You simply wait until you see a great deal on an item on the list you’ve created and then go buy it. You don’t have to wade through hundreds of people or fall victim to the clever product placements of those large retailers! Not to mention there’s usually better sales online than offline. Another great thing about shopping online is using promo codes! I much prefer online coupon codes to regular coupons. A great way to set your budget and find the coupon codes is by using Chippmunk. With Chippmunk you can pick a retailer, shop by department, and set your budget. After you do those things Chippmunk will bring up results showing you awesome deals for your selected criteria! And being that today is Cyber Monday it’s a great site to try! 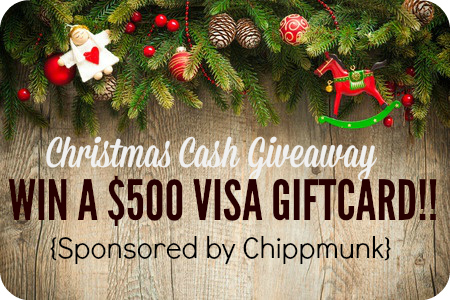 And now, to make your money go farther we’ve partnered with Chippmunk to give one lucky winner a $500 Visa gift card! This giveaway is open to residents of the United States and will end at 12:00 am on 12/15/14. You can enter the giveaway through the Rafflecopter widget below and the winner will be chosen at random. See the rafflecopter for terms and conditions for more info. Good luck and Happy Cyber Monday! Previous Post: « Common Freelance Advice I’m Glad I Didn’t Listen To! Using a list has really helped us out a lot over the years. I swear whenever we don’t use a list we end up buying double the amount of presents because we always forget the first set of ones we purchased. That’s how I am no matter where I shop. If I don’t use a list I way overspend! Great tips, Alexa. I like this time of the year, now. Retailed killed it for sometime but now I’m starting to like it again. Hey Alexa, great list! I also like to use Retail Me Not for coupon codes – free shipping, heyyy! 🙂 Thanks for the awesome giveaway, too! Yes, free shipping is awesome. I usually won’t buy anything online if there isn’t free shipping! Love these tips! I like shopping locally, too, but sometimes the convenience and deals online just can’t be beat. This time of year there’s so many opportunities for free shipping, but at other times of year I just do the free ship to store option. Yes I love free shipping. I’m still trying to do some shopping locally though but you’re right – the good online deals plus the convenience makes it so tempting to do all shopping online.